This is their first new studio album in four years and I do believe it is their fourteenth overall. This album sounds like…R.E.M. Really, their style hasn’t changed much since their past few albums. It’s instantly recognizable as R.E.M. Most of the songs are upbeat and fairly short (the whole album clocks in at under 35 minutes) though there are a few slower songs. Some of the lyrics appear to have political overtones but of course they could also just be Michael Stipe’s playing around with words. 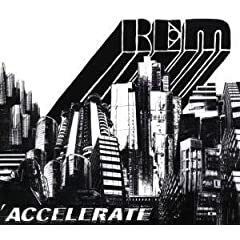 This album is pretty good overall, there are a few weak moments, but R.E.M. fans should be pleased for the most part. This entry was posted on April 22, 2008 at 5:39 pm and filed under TheSlacker. You can follow any responses to this entry through the RSS feed. Tags: it's R.E.M. fools what more do you need to know, R.E.M. « The Okmoniks – Party Fever!! !